Even though the weather is starting to turn cold and blustery here in NYC, I love to wear lots of color throughout the fall and winter months. 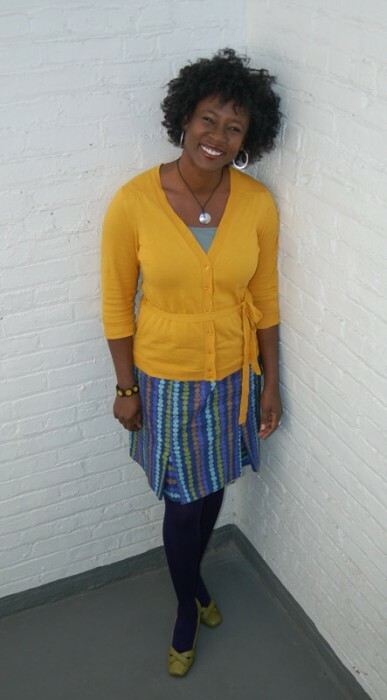 Here’s my take on the Market Skirt with the kick pleat option made up in a cotton twill from the Lisette Fall fabric collection. Since I was working with a directional print, I turned the stripes sideways inside the kick pleats for a fun detail. I usually wear my shirts and sweaters over the top my skirts, so I left off the button tabs at the waist. I was inspired by all the fun colors in this print so I took a colorblocking approach to styling it to highlight some of the colors. As soon as the weather turns cool I raid my drawer full of colored tights and I just happened to have the right shade of purple to go with the skirt. And I’ll take any excuse to pull out my lime green pumps. I would love to see how you style this skirt. Post your own photos to the Lisette Flickr group and show us how you wear your style! It’s beautiful! I love the “not afraid of colour” in this season! It’s very cute,but the fabric looks as if it might be a little light for a bottom weight twill. The few times I’ve sewn twill it didn’t wrinkle like that.